CERTIFIED TREE HUGGER. It was the first time for 16-year-old Angela Anero to support the reforestation caravan with her mother, a PBSP employee. CEBU CITY – In an effort to conserve and manage the watersheds of Cebu, over 200 employees from 20 companies and organizations joined Philippine Business for Social Progress (PBSP) and the Department of Environment and Natural Resources (DENR) in kicking off its 27th Cebu Hillylands reforestation caravan recently. 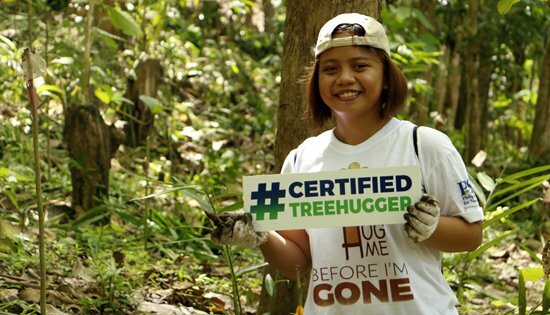 The Cebu Hillyland reforestation caravan supports the rehabilitation of the 29,000-hectare Central Cebu Protected Landscape (CCPL), also called the Cebu Hillylands. As the largest rainforest and only source of potable water in Cebu, CCPL recharges the province’s groundwater reservoir and is home to several endemic and indigenous plant and animal species. Now on its 27th year, PBSP aims to reforest 30 hectares of the Buhisan Watershed and Forest Reserve (BWFR), by bringing the business sector to either adopt a hectare for reforestation or mobilize tree planting volunteers. The annual kickoff also aims to ensure 85 percent survival of the trees by tapping partner communities to establish and maintain the adopted reforestation sites. For this kickoff, the volunteers planted 25,000 seedlings within 10 hectares of the BWFR, where Cebu’s 106-year-old surface water dam is also located. It was the first time for 16-year-old Angela Anero to join the refo caravan kickoff with her mother, who is a PBSP employee. While she is active in doing community service in her school, planting for Cebu’s watersheds was a totally different experience for her. “It is not just planting a tree, but the right ones that will really help protect our water reserves and other life forms. It is exciting when you learn that you are planting for the future of our forest. I also feel proud to be part of the advocacy that my mother’s NGO works for,” she said. Ludo & Luym Corporation Production and Operations Manager Nidal Bergado, on the other hand, is no stranger to such activity as he has been volunteering his time as a tree planter (hugger) since he was a child. His father, a school principal, would always remind him on the importance of trees and plants and would often bring him to the outdoors to plant trees. His love for the environment continued as an employee volunteer for the company in PBSP’s annual reforestation caravans. “I always volunteer to plant trees whenever an opportunity arises because I know how important a tree is. Since PBSP’s reforestation caravan started in 1992, our company has always been supporting the cause by sending in volunteers. We also adopted a hectare for reforestation,” Bergado said. Since the launch of PBSP’s reforestation caravan some 27 years ago, the business-led NGO has planted about 4.1 million tree seedlings in 1,640 hectares with help from 16,361 volunteers. Through this, PBSP has successfully uplifted the lives of more than 200 farmers in CCPL by tapping them as partners of the program. Participating companies of the kickoff include AAI Worldwide Logistics, Inc., Asalus Corporation (Intellicare), Certa RCube Technologies Corporation, Connected Souls, Funai Electric Co., Ltd., Halsangz Plating Cebu Corporation, Ludo & Luym Corporation, Philpacific Insurance Brokers & Managers, Inc. Cebu (Philinsure), R.A. Mojica and Partners, San Nicolas Elementary School Teachers and Employees Multipurpose Cooperative, St. Theresa’s College, Taiyo Yuden Employees Multipurpose Cooperative, TMX Philippines, Inc., Vivant Corporation, and Wellmade Motors and Development Corporation. The kickoff is also in partnership with the local government unit of Barangay Pamutan, the Emergency Rescue Unit Foundation, Cebu Provincial Disaster Risk Reduction and Management Office, and the Bacsan Sapangdaku Farmers Association.